As the Danish cuisine is partly inspired by the French, stocks and sauces form the base of many dishes. So most Danes love a good sauce. Unfortunately, there is not the same love for cooking a stock and spending a long time on it. This is a recipe for a "fake" sauce which you can make quickly, and which tastes like an *ok* gravy. But more importantly, each ingredient can be used to improve other sauces. So you can make a weak sauce much better. I also explain what each ingredient does for the sauce, and explain a lot about taste in the process. Let me start right away by saying that I am a little embarrassed ... This is all cheating and tricks. But then again, I also have to make the kind of food where you got 45 minutes to produce something edible, before one kid need to leave and do sports and another kid has to be brought back from another event. So sometimes it happens that I do things like this. I am a sinner! I know. All right. This sauce taste fine and can easily be eaten, but is not a * great * sauce. This is like a "pan sauce" as we normally use for hamburger patties. However, it is good enough that most people will not know that it is a fake. The reason I have the recipe here on kvalifood is mainly to show the "tricks" you can use when you make "real" sauce and stews yourself. This is the tricks that I use myself sometimes to save an otherwise dull sauce or dish. All the ingredients in the sauce are long-lasting manufactured goods. This makes it easy to have them in the cupboard for a long time until they are needed. At the same time it is high quality products, that the producers have cooked or fermented for a long time. This means that they have a reasonable complexity in taste. So the sauce is not too flat tasting. You can choose to use any one or more of these tricks in your own sauces. But do not use more of each ingredient than I describe. If you are using twice as much of an ingredient, it will be too pervasive. It is strong stuff we are dealing with, and a sauce that tastes of fish sauce or ketchup is no pleasure. Most people know the four basic tastes sour, sweet, salty and bitter. It is also getting more generally recognised that there is also a flavor called umami, which, roughly speaking, is the taste of meat. The ingredients in the recipe is selected to obtain a good balance in the five taste. The stock cubes I can buy here in Denmark states I should use 1 cube for ½ liter of water (2 cups). But that will make a stock of soup strength. Not sauce strength. Therefore, i recommend 2 cubes for ½ a liter of sauce. Stock cubes contain quite some salt. Which is one reason that there is no added salt in the recipe. Stock soup cubes are actually the only thing that is really "bad" in the recipe. The other ingredients are of reasonable quality although they are durable perishables. In asian stores you can buy "chicken powder", which is basically the same as stock cubes. You can get a *much* better sauce by changing cubes and water for a real stock. Either from cooked meat or vegetables. Then, however, you should add salt. It takes a bit longer, but then on the other hand, you will not feel ashamed to serve it. Normally, you make a sauce stock by reducing a stock. That means you enhance the umami taste in the stock. Adding fish sauce plays the same role in this sauce. 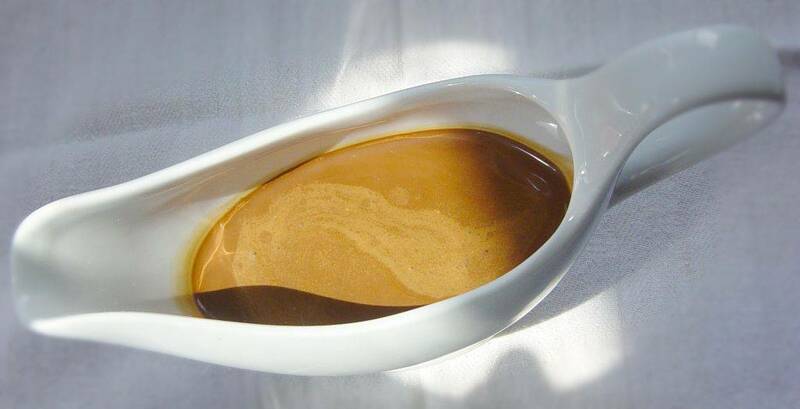 Asian fish sauce is made by salting and fermenting anchovies and other small fish. The liquid coming out when pressing the fermented mass of fish, is fish sauce. It smells horrid. Like an industrial harbor. But it has a very strong umami taste. It is also very salty. You don't use much of it though, so the fish sauce aroma is diluted enough that it no longer smells of fish. But it provides a very complex flavor. It does not cause the final sauce to taste of fish at all. It is made in much the same way as fish sauce, by spicing and fermentings oysters. At the same time GSM (the 3. spice) is added . Which simultaneously enhances the umami taste, and the other flavors in general. Oyster Sauce tastes most of all like very strong pan sauce. It gives depth to the flavours and adds even more umami. Ketchup consists of tomatoes that are cooked in with sugar and vinegar. Professional chefs use a "gastrique" to balance the sweetness and acidity of a sauce. It is made by caramelizing sugar and then adding, for example, red wine vinegar. So you end up with the sweet-sour syrup called gastrique. In one of my favorite sauces "sauce espagnole" there is tomatoes added to it, which are then cooked along. This provides both depth of flavor and better color. So by adding tomato ketchup you achieve at once, both the boiled-down tomatoes from the sauce espagnole, and the cooks gastrique. Tomatoes are also packed with umami. It goes without saying that it should be a good high quality ketchup made from tomatoes, otherwise it does more harm than good. Whipping cream makes all the different flavors "connect" a lot better. So they taste like the sauce has cooked for a long time. The taste gets rounded of. I guess it's because of the small fat globules in the cream. It also makes the sauce opaque. Like a sauce would be if it was thickened with flour. I like That . Corn starch is the easiest way to thicken a sauce. Flour has to cook for a long time before it loses the flour taste. It just have to be brought to a boil. It does not taste of anything and has no role other than to thicken. You cannot use corn flour, as it makes grits in the sauce. A "real" brown sauce turns brown by frying the meat, bones and vegetables brown and then cook fund them. Often also by browning the flour for thickening. When the stock then is reduced to between 1/3 to 1/10, the stock becomes really brown and dark. But there's no place for such luxuries in a fake sauce. Darkening is malt/sugar that has caramelized to make it completely black. It gives a darker color, and has very little. It has no other function. So that was my dirty sauce tricks. Do you have any?